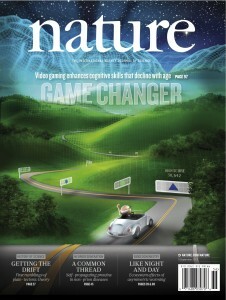 Today, Nature published evidence that training on a multitasking video game improved older adults' cognitive ability beyond the scope of the game to untrained aspects of cognition. The article featured a four-year research led by Drs. Adam Gazzaley and Joaquin Anguera at UCSF. They utilised a relatively simple video game, NeuroRacer to train older adults on multitasking. NeuroRacer requires participants to drive a cartoon car, and to respond to relevant signs as they appear: simulating a day-to-day scenario of driving and responding to traffic signals or street signs. A long-lasting plight for cognitive ageing scientists has been the lack of "Transfer" in training tools. That is, training can reliably improve older adults' performance on the tasks they are trained on; sometimes they even exceed their younger counterparts. However, these changes all too often do not transfer to other tasks that utilise different aspects of cognition ("Cognitive Domains"). By comparing participants' brainwaves and test scores on various cognitive domains the were recorded before-, after-training, and 6 months later, Drs. Gazzlaey and Anguera were able to see whether the game's benefits transferred to untrained domains. These tests included sustained attention, inhibition, working and long-term memory, logical and visual reasoning/memory, motor control, etc. They found that training on NeuroRacer's multitasking version benefited cognitive control abilities, such as sustained attention and working memory. After training, older participants' brainwave activities were more similar to those of younger adults. Additionally, these changes were still there after six months. Moreover, they reported evidence that these improvements were related to training-induced neuro-plasticity, and that they were not present if participants were trained on the drive and the sign tasks separately. Many consumer games claim to "improve the brain". Many of them lack empirical testing, and others showed mixed results in the ability to promote transferable benefits. In my opinion, NeuroRacer stands out from the crowd because of its immersive environment and that it forces the brain to do multiple things at once. If I were in the market for "brain games", I would look for to select training games that reproduce these strengths. Joey Essoe is the investigator for the aforementioned NeuroGrocer study (an offspring of NeuroRacer), under the supervision of Drs. Anguera and Gazzaley.